Today I feel like the time has come to review the mask that has changed my idea of face masks forever. I have always had at least one face mask, mostly a clay-based one for oily skin, but I cannot say they have really ever made a huge difference, other than drying up my skin. It’s not like my blemishes have never disappeared over night. Times have changed, my skin has changed and I’m now on the dry side of the skincare world. 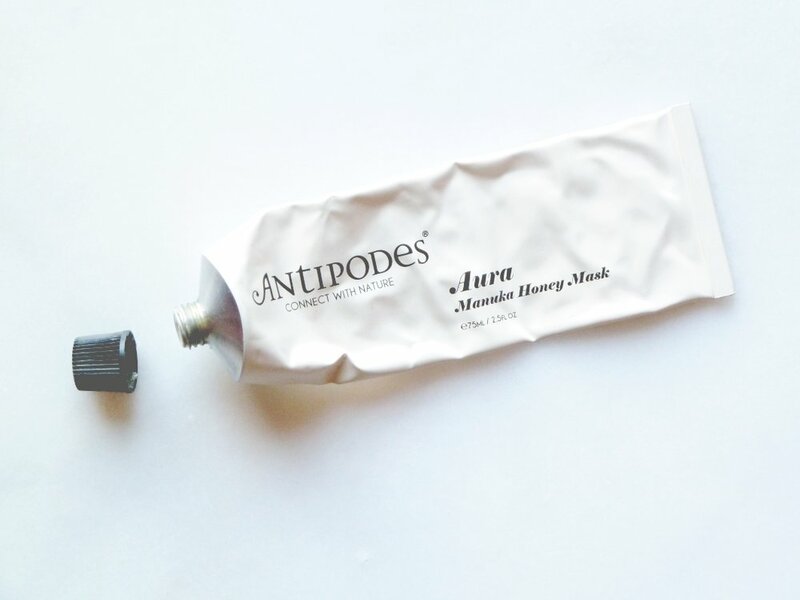 I don’t know where I first heard of the Antipodes Aura Manuka Honey face mask, but it seemed like it was everywhere on the beauty blogs I was following. I therefore jumped at the chance of getting it for €21 from lookfantastic and couldn’t wait to use it! Here are some of my thoughts on it and we’ll have a closer look at its ingredients and what it aims to do. It is a face mask from New Zealand, containing Manuka Honey, a traditional antibacterial ingredient which “powerfully draws moisture to the skin and hydrate it intensely”. Though it’s designed for blemish-prone skin, it’s also a very hydrating and soothing face mask. I don’t have particularly blemish-prone skin — not anymore at least! — but rather dry skin, which can often turn a bit red. This mask works wonders at calming down the red on my cheeks and I’ve used it countless times to soothe my skin after a shower, when my face is red, peeling and feeling drier than ever. I also use it after a strong treatment like the Glycolic or Salicylic acids from Bravura London. I sometimes felt a bit of tingling in the first few minutes after applying it, but nothing to be scared of. I’m still not sure of the reason for it, but it certainly didn’t make it any less effective! This mask has a thick creamy texture and is very easy to apply to the face with your fingers, it won’t drip off. It has a lovely smell of vanilla and honey, very delicate. You can see that this fragrance comes naturally from the ingredients it contains, such as vanilla oil, mandarin oil and, of course, Manuka honey. They recommend applying a thick layer and leaving it on for 15 minutes. I find that I got the best results when I left it on for as long as possible, even for up to one hour. The skin absorbs it all. I then remove it with a damp warm flannel. Your skin is left calm, plumped and extremely soft. I then proceed with a spritz of toner, a serum and a moisturizer. As for how often I’d suggest using it, I use it whenever I feel the need, usually twice a week after showering, having cleansed my skin before getting into the shower. I would also recommend using it before a big event because it will make your skin look flawless, moisturized and soothed. I totally would. I’m already looking for something to take its place and I know it’s going to be hard to fall in love with a new mask. It will be a tough decision, I know I’ll miss it. The only reason I’m not buying it again for now is so I can try a few new things! Depending on where you get it, the price may vary. I got mine here where it now retails for 28€/£22 while it was on offer but you can get it for less here (22€/£19). The tube size is 75 ml and mine lasted around 4 months, using it at least once a week. It comes in a metal tube which I found very practical, as you can squeeze it out till the last drop. This is the kind of mask that could really be of benefit to any kind of skin, which is not so common for a mask. I cannot really speak for people with blemish-prone skin, but considering that it’s designed for them, I’d feel comfortable recommending it. From my experience, it is a dry skin saviour. Whenever I have used it on red and angry skin, it has soothed everything and made it look a lot better afterwards.